Foodista | Recipes, Cooking Tips, and Food News | Warino Family "Viscots"
Preheat oven to 425o F. Melt margarine and let cool. Put yeast and water in a cup and set aside to bubble. Cream together eggs, sugar, salt and cooled margarine. Add in remaining ingredients and mix, then add yeast mixture and mix again. Place on floured surface and knead well. Set aside 10-20 minutes. Roll into thin logs and form into pretzel shapes. Drop in boiling water. When they rise to the surface, drain on clean towel to cool and dry briefly (a few minutes.) Place on a greased cookie sheet and bake for 20-25 minutes, until golden brown. Note: Because they are not very sweet, I tried my own variation on half this batch of viscots. After draining the viscots on a paper towel, I dipped them in sanding sugar (which is coarser than regular sugar) and baked them as above. They came out with a light sugar crust and were a bit sweeter to eat. Try it and let me know what you think. These cookies came to the U.S. with immigrants from the Puglia Region of Italy where my husband's grandmother grew up. 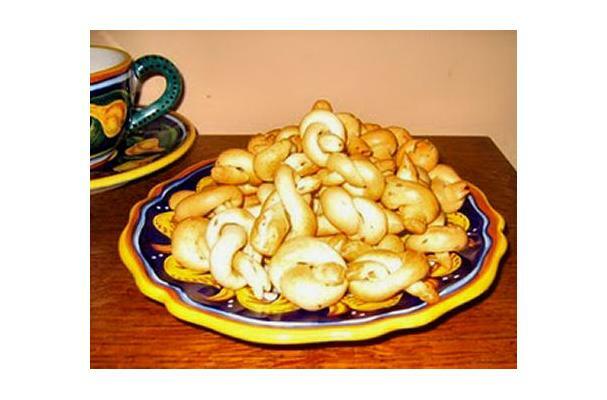 Also known as "Taralli Baresi" the cookies are a cross between an anise/fennel-flavored a pretzel, and a bagel. They are to be enjoyed with a glass of wine, coffee or by itself!